I’m sure many of you have a tried and tested way of putting a new purchase or product through its paces. Maybe it’s that run to breaking your new running shoes, riding up that hill to see how light and responsive your new bike is, or by doing “keepie uppies” to judge the ‘touch’ of your new football boots (soccer cleats). Whatever it is we all have our own performance barriers that we use every day to decide whether we give a product the time of day or we walk on by. 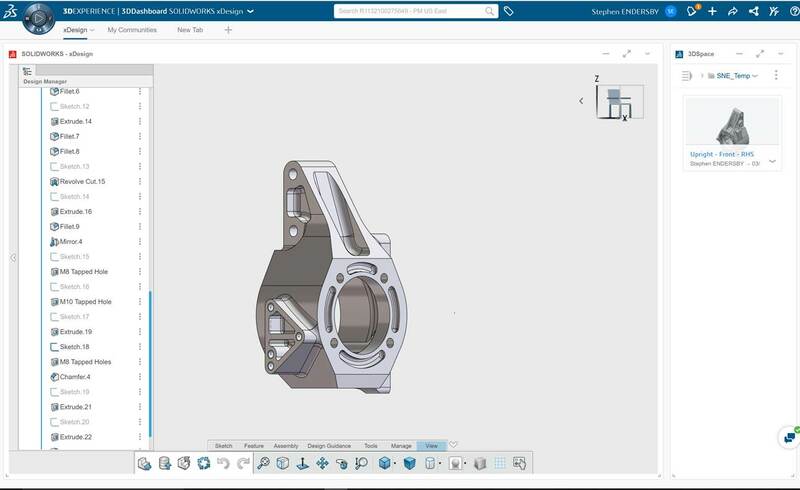 So what does this have to do with SOLIDWORKS xDesign? Well my ‘sniff test’ for CAD is to model the front suspension knuckle of a small Japanese rally car from the early 2000’s. Now it’s not a complex part, but it has the virtue of using many of the common sketch entities and features that a typical user would want to use all day every day, and that it is a ‘real manufactured component’ and not some imaginary arbitrary test. So when I was invited to present at the SWUGN Technical Summit in Anaheim, CA on xDesign, I once more turned to my standard test. 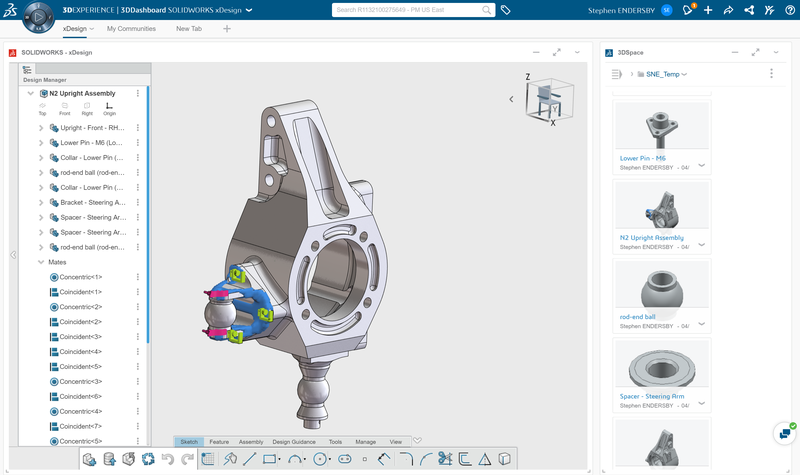 I had tried this test on xDesign beta versions on R2018x in 2017 without ever completing the part so I was interested to see what progress had been made with the latest production release (2018x FD01). I was immediately struck by the improved ‘snappiness’ of the program and improved selection ‘politeness’ and I made quick progress building my part. The first real sketch test is the creation of the curved slots on the front face. Because xDesign doesn’t have curved slot sketch entity, you have to build this up by hand. This is where previous versions of xDesign had struggled to either complete or it would slow the system down to a point of zero productivity. But the current version breezed through this previous unsurmountable hurdle. After that the only ‘challenge’ that I had was to build the standard holes by hand rather than by using a hole wizard. 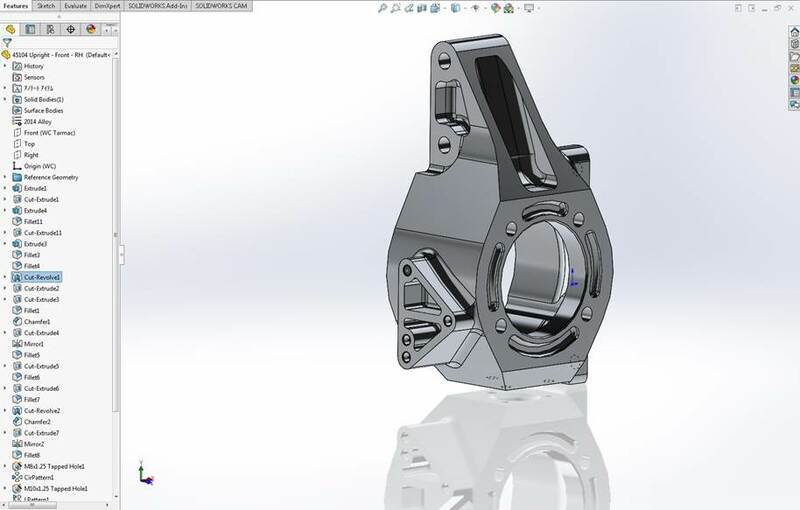 And soon, for the first time, I completed my standard CAD test in xDesign. Now I’m not going to claim that modelling this component in xDesign is as fast as SOLIDWORKS, but to me this was a huge hurdle crossed. So after that I got a bit carried away creating an assembly and Design Guidance on one of the parts. After completing my ‘modelling test’ I thought I would take a look at the ‘anyplace anytime’ promise of xDesign. 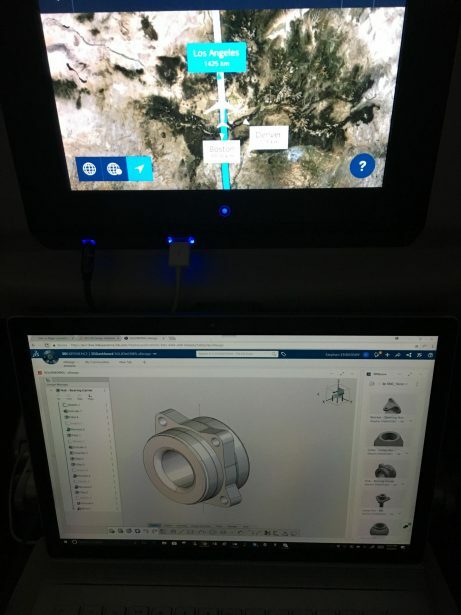 So on my flight to California I connected to the inflight WiFi and launched xDesign and I waited. I waited a bit more and was rewarded. My last modeling session popped up and I was good to go. So in conclusion, xDesign is here, it can do real work and I can’t wait to see what enhancements happen in the summer.